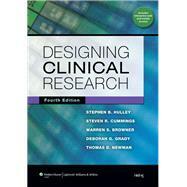 Designing Clinical Research sets the standard for providing a practical guide to planning, tabulating, formulating, and implementing clinical research, with an easy-to-read, uncomplicated presentation. This product incorporates current research methodology--including molecular and genetic clinical research--and offers an updated syllabus for conducting a clinical research workshop. Emphasis is on common sense as the main ingredient of good science. The book explains how to choose well-focused research questions and details the steps through all the elements of study design, data collection, quality assurance, and basic grant-writing.